Central Louisiana may be best known for its Cajun recipes, hungry alligators and the “Steel Magnolias” movie, but its growing festival culture and laid-back bayou getaways are attractive to urbanites and nature lovers alike. Louisiana’s oldest town, Natchitoches, is no exception to the trend. Natchitoches, established in 1714, has a world view derived from French, Spanish and American influences of more than 300 years. It is also an ideal location for a family reunion destination. 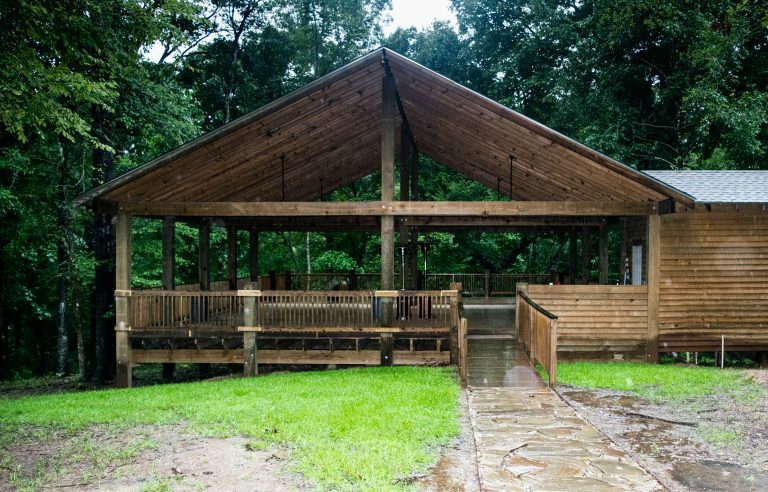 When my family needed an easily accessible and affordable location for a milestone celebration, the Cabins of Horseshoe Hills Ranch, on the banks of the Natchitoches’ Cane River Lake, was ideal. 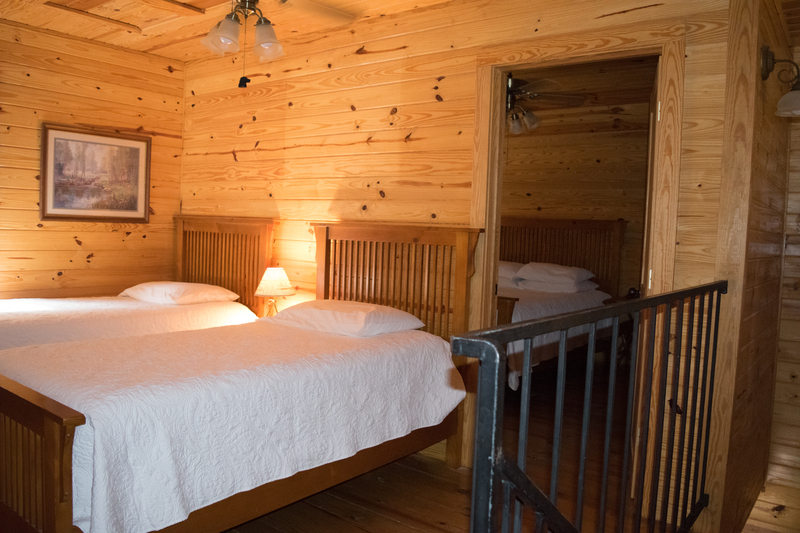 The facility offers six log cabins for nightly or weekly rental. Architecturally authentic to the region, these cabins use pine throughout. Five of the cabins have identical floor plans, while Cabin #6 features an additional toilet adjacent to the upstairs master bedroom. Our family rented four of the cabins for a weekend retreat and were able to gather as a family for group activities. We still had the flexibility to retreat to individual spaces for the children’s (and adult) nap times. Each cabin has designated vehicle parking spaces at the front entry. Private key coded door locks ensure safety and privacy. Upon entering Cabin #3, the downstairs is cozy, but comfortable, with open congregation spaces. Three bar stools provide additional seating and extend the conversational areas for both the kitchen and living room. The plush, brown microsuede sofa suits the room well, as does its comfortable lodge-like décor. The kitchenette is well-appointed with a microwave, oven, stove, compact under-counter refrigerator, and a general assortment of cookware, dishes, silverware, and cleaning supplies. 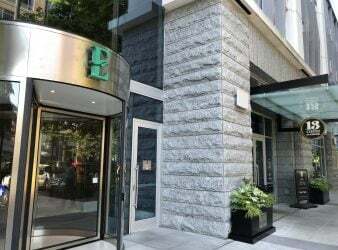 All of the usual hotel amenities are provided – iron, hair dryer, lounging chairs, towels, linens, extra blankets, and assorted toiletries. Fifteen steps up a narrow stairwell with black wrought iron banisters puts you in the upper loft area. These cabins are designed to sleep six guests, with a queen bed and two twin beds in the upstairs rooms and a pullout queen sofa bed or futon at ground level. Ceiling fans throughout the upstairs bedrooms whir in the night, creating a gentle white noise to complement the sounds of crickets and nature’s evening melodies. The front and back porch seating (chairs or swings) allow for more private conversations and quiet reading spaces. After an evening in the relaxed rural atmosphere and a good nights’ sleep, the early morning is a perfect time to go exploring. 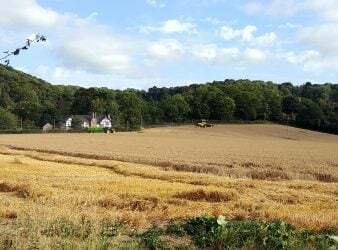 A walk around the property revealed many activities – something for everyone! Our four-year-old explorer headed out in a facility-provided canoe with her father and grandfather to enjoy the natural scenery, while singing “Row, Row, Row Your Boat” to her navigation crew. The boaters didn’t catch any fish but noticed the fish cleaning station near the paved boat ramp, complete with large sinks and overhead roof for protection against the elements. Another group ventured back towards the gated entry to the grounds, where they discovered horses in the fenced pastures. The resident dogs, named for political figures, made rounds of the property and joined in with our family at intervals throughout the day. I walked with my mother, looking at local vegetation before settling into a wooden swing near the fire pit. With six large swings in a circle on a stone-paved surface, this social gathering spot soon attracted the rest of the family for an afternoon of casual family conversation. A local organization reserved the pavilion for the afternoon. The pavilion has abundant space for a fun large group event, yet our smaller group still enjoyed sufficient privacy. The pavilion can be reserved for a fee, or if not pre-reserved, is available for cabin guests to enjoy. The building is surrounded by lush forests, easily accessible by car and near to the cabins. It is evident that this family-owned business provides personal touches to ensure the best experience for every guest. The pavilion provides an outdoor gathering spot for multiple families. 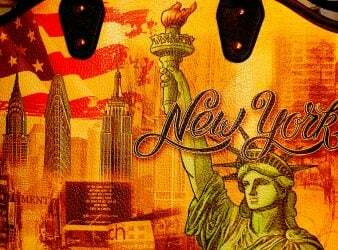 It is an added asset when looking for a family reunion destination. 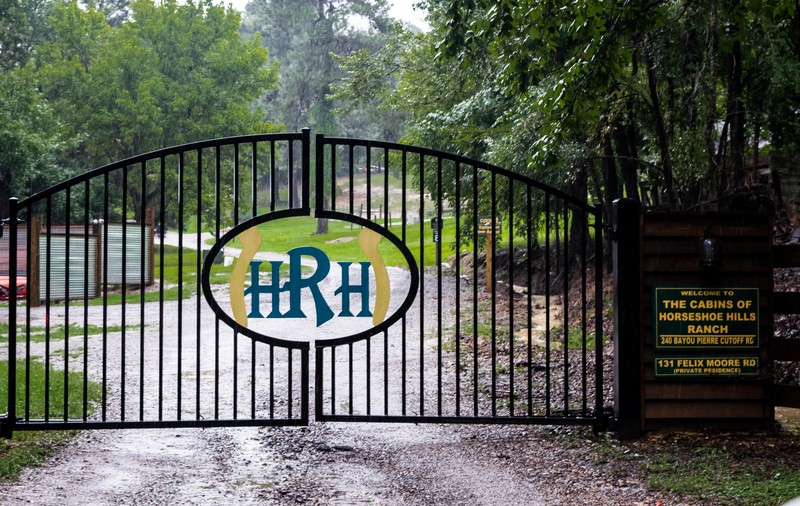 The Cabins at Horseshoe Hills Ranch are located at 240 Bayou Pierre Cutoff Rd, Natchitoches, LA 71457. From Natchitoches, the travel north of town on Hwy 1. Upon arrival, enter the coded security gate (code provided with reservation confirmation). Next proceed forward along the road, following signs pointing the directions to the cabins. 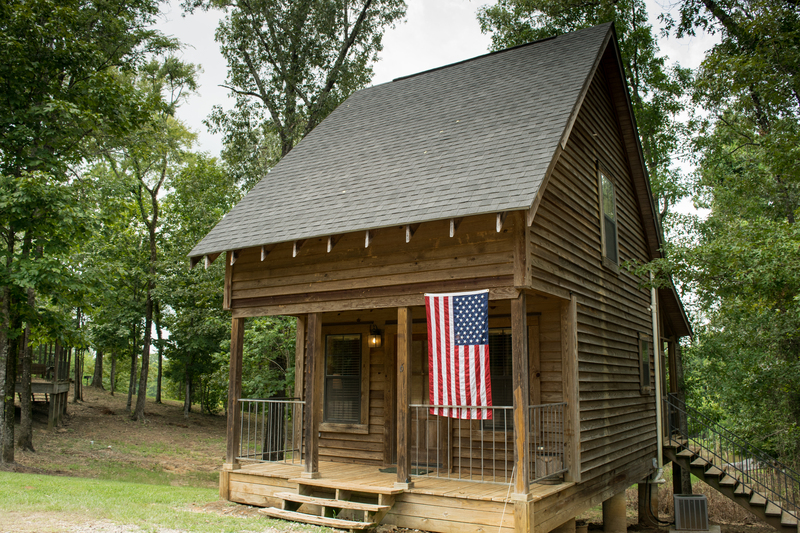 Upon reaching the cabin area, the first cabin is Cabin #1 and the numbers are on the front porch posts. Canoes are available at no charge, but guests are advised to bring life vests. The ranch dogs are very friendly and are swift to sneak into a cabin when the door is ajar. Guests with pet allergies should be aware that this is a pet-friendly property with resident dogs. Dog lovers, you will be right at home here! While the brown pelican has been the designated official state bird of Louisiana since 1966, the mosquito is often cited as the unofficial state bird. These are some giant mosquitoes with a piercing bite! Bring appropriate mosquito repellents. Use fans to keep the air circulating when mosquitoes are present. Thanks! The cabins are secluded, but near to downtown Natchitoches. The movie, Steel Magnolias, was filmed in this small Louisiana town. We enjoyed the weekend with our family but want plan another trip to spend more time exploring the area’s rich history. 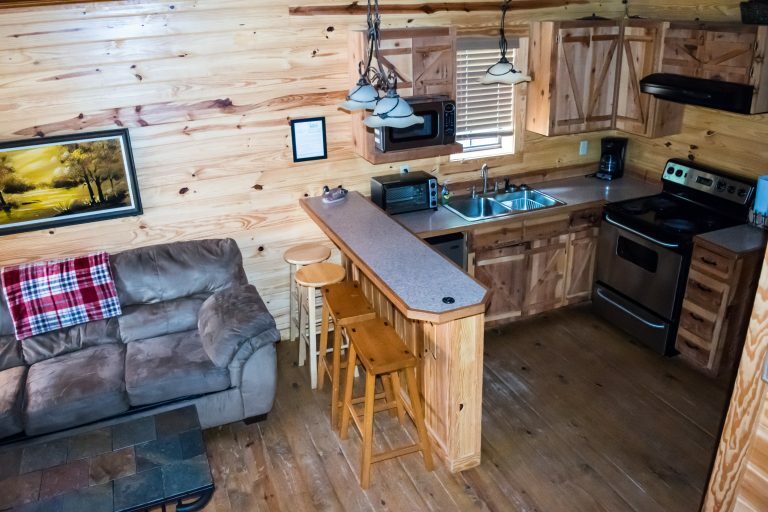 The Cabins at Horseshoe Hills have been added to our list of favorites!